Star Trek: Discovery stars walked the red carpet last night in New York to celebrate the premiere of season two. We’ll be bringing you interviews from there all week. We managed to snag a few minutes with Anson Mount, who made his debut as Captain Pike in the season’s first episode, to get whatever he was willing to spill about Pike’s personal journey as a character. How does the Pike we see in “The Cage” affect the Pike we’re seeing now on Star Trek: Discovery? Mount: Well, that’s the best question I’ve gotten all night, because my job was to come in to a role where the first acts and the third acts are established, and figure out how to make the second act work. And there’s one thing I wanted to do, and I was very adamant about this from the top and I think that the writers agreed with me, is that how do you make a Pike, where what we know about the third act of Pike is not a tragedy, but a victory. Right? So that was the goal. And I think we succeeded. We’re filling in a lot of the missing story in season two — of the story of Captain Pike. And I think fans will be pleased. As a fan, I can say that. I hope people agree with me. I don’t think I’m being biased. Maybe I am. EDITOR’S NOTE: Star Trek history sets TOS “The Cage” in 2254, DSC “Brother” in 2257 and TOS “The Menagerie” in 2267. (Asked by another interviewer) What do you draw on to fill in Pike, since we know so little about him in the Prime timeline? Mount: I’m an actor who does his research. But in this particular instance, I decided that second act Pike is a completely different human being than first act Pike. Like, I’m a different actor than I was in graduate school. I’m a different human being than I was when I was in high school. And so I wanted second act Pike—the version that we’re seeing in the second season of Star Trek: Discovery—to be its own thing, and I couldn’t do that by using the same tracks that have been laid by Jeffrey Hunter, as much as I respect him. Or Bruce Greenwood. And I’m a huge Bruce Greenwood fan. HUGE Bruce Greenwood fan. But I just needed this version of Pike to come from my own experience. Who is he going to come into conflict with? Mount: I can’t tell you that. You’re sneaky. You’re really sneaky. Saru was the captain, and now he’s not, so will there be some conflict there? Mount: Maybe there will be, and maybe there won’t. You’ll never know. I will tell you that we get to go to Saru’s home planet. And that is just one of many instances in this season where Star Trek: Discovery is closer to the original. You’re going to find it a little bit closer to the episodic structure of the original. The big idea of the week. And you’ll see that in how that structure is set up in the first episode. These seven red signals that have been appearing in different parts of the galaxy. You can sort of see where I’m going with this, right? So check it out. I really like this guy and he seems to be having a lot of fun. Pike and Burnham have a brief exchange about this in the first episode of the season, they say something about how the Enterprise was out on the edge of the galaxy on their 5 year mission. So even if they were recalled it would have taken them a long time to get back to Federation space. Burnham also says that the Enterprise was ordered to stay away for a reason, that it was an instrument of last resort. That’s what I picked up on, too. The Enterprise was essentially out there to ‘break glass in case of emergency’. Also, in TOS capturing the Enterprise was viewed as a prize, not because of the ship’s technology but because it was the Enterprise. And yet I guess the war going so badly using a “last resort” was apparently still out of the question. I think you can get a new trial by using a different e-mail address to register. Not sure about that tho. Another way is if you have Amazon Prime, you can get a 7-day trial of All Access as an Amazon Channel, it’s a separate subscription because you’re going through Amazon’s ecosystem for both streaming and payment, so it’s also a separate trial. Nice tip, Matt. Thank you. That was actually explained in a very quick line of dialog in the episode. The mighty USS Enterprise was a) so far out on the frontier it took months for it to get back to Federation space, and b) it was deliberately held back in reserve in case the war effort needed one last big gun in a crisis. An upcoming Discovery novel will deal with Pike’s experiences during this wartime period. Geez, wasn’t the Fed at or past that point when DSC came back from the upside down? In terms of a last resort, there isn’t much point in setting off the doomsday machine if you’re already lost 90% of your territory, or whatever the number was. Explanation of this connie’s locale and status sounds kind of ret-connie from here. Reminds me of the Borg invasion, whenwenn SF ordered the Enterprise E to keep away. In FC, I could imagine some of the admiralty seeing Picard as a piece of weak armor — certainly that female Admiral N considered him something of a weak sister for a time. So there’s at least a TINY rationalization offered there (not a big fan of FC, so I wouldn’t be defending it heavily in any case.) My big problem with that is that it seemed like a cheap way for the writers to get Picard to tick off the ‘defy authority’ box. I mean, with Kirk in SFS, you have a series of events that trigger the stealing of the Enterprise, so you get a feeling that world is crumbling around them — a Starfleet officer being told by Fed security to not discuss certain matters in public? How 70s political paranoia can you get? — before they act to go back to genesis, which dramatically is a pretty good way to go, even if the rest of the movie is mindlessly stupid in it plotting. Maybe we need to see the alternate reality version of the end of last season, where DISCOVERY does not come back to save the day, and instead we see the Enterprise coming out of the sun like Han Solo at the end of SW to route all the baddies with one massive salvo. It kind of worked in ALL GOOD THINGS with the monstertruck verion of the -D, anyway. @GT — its possible that by the time the Fed. recalled the Ent. the war escalated faster than they anticipated, and it still took Ent. so long to return that the Fed. was forced into the corner we saw them in, and then the war was over by the time they arrived. Keeping the Ent. so far out also meant that the Klingons probably would not expend the resources to go after it. I also like Holden’s idea below that the Ent. could have been a lifeboat for the Fed. The Federation didn’t actually loose all that much territory, that’s one of the issues with trying to squeeze in this supposedly massive war not long before TOS. When the Discovery gets back, 9 months later from when they left, to our universe, the dialog says 20% of Federation space had been lost to the Klingons. Which is not tiny, but it’s not massive either. If stuck with the proposition of the Enterprise too far away, I think I’d’ve glommed onto some of the setup for Blish’s SPOCK MUST DIE! and have the Enterprise caught on the wrong side of the battle, behind klingon space, and fighting smashNgrab style at their supply lines and such. You could even have done a whole prequel mini-series about that, rather than have them just ‘away’ which is kind of the way I feel that the trekmovies in TNG era missed out on doing something with the big DS9 war. I’m just glad there were no spoilers. Until late this weekend I cannot visit certain articles here. Regarding what he has said about Pike… It all sounds good and reasonable. Pike has already become the most interesting character on the show. And I haven’t even seen an episode with him in it yet! He’s really good. Really the highlight of this episode. Good to know from the actor that they intentionally laid out this Pike as a “completely different human being” from Cage Pike. Because that’s exactly how he came off in the season opener. His analogy with high school falls apart however in that only a very few years have passed since The Cage and in adulthood people don’t change nearly as much anymore as in their formative years. How exactly did “The Cage” turn Pike from the brooding “by the book” guy into the informal “let’s have fun” guy? Human psychology does not work like that. I think it’s also fair to point out that we have also seen another version of Pike in the Kelvin movies and that Mounts version isn’t too dissimilar to this portrayal. Recent news about the Picard series and interviews with Kurtzman and Kadin have made it clear they are treating these movies as canon so it’s not unreasonable to draw on this characterisation for inspiration even if those adventures are set in a parallel universe. However, even if we are to only consider prime universe sources when contrasting the two portrayals then it’s still all comes back to the fact that Pike is in mourning during that original episode. It’s fair for you to point out that adults don’t typically change that much in just a few years but people do act differently when they’re grieving so it’s not far-fetched to assume that Pike could have conducted himself in the same manner that Mount depicted prior to the events on Rigel VII as well. This is a fascinating angle: so you are saying we never knew the “real” Pike; in “The Cage”, he was emotionally crippled, and in “The Menagerie”, physically. I suppose the “reboot” of the character could be rationalized this way; but I will say I liked the quieter, more level-headed Pike better than the one who delivers one-liners like “Hit it” or “Fly good”. Of course, it is early days and we will many more episodes in season 2 to see the broader canvas of who is THIS Captain Pike! @Vulcan Soul Yeah that’s pretty much what I’m saying. Admittedly it’s a retcon but theoretically had Hunter continued in the role after the Cage its more than feasible that studio bosses would have insisted on making him more of a typical swashbuckling type of hero so we could have conceivably seen the character developed along a similar trajectory to where they’re going now with Mount. I too was a fan of Jeffrey Hunters Pike so I get what you’re saying. Personally I did like Mount in the role and thought he was the highlight of the latest episode. I think it’s to be expected that we got a lot of action in the season premiere but hopefully we will get to see a more nuanced portrayal as the character is fleshed out. @Curious Cadet I don’t know if I’m saying that Roddenberry had an arc planned out (although I like that idea) more that it was likely the studio might have pushed Roddenberry to make the character more dynamic. Also I think it’s fair to say that had Hunter been retained in the role he wouldn’t have been mourning the loss of crew in every episode so that in itself would have meant we’d have seen other sides to his character. Yeah, I think it’s reasonable to think that the events of The Cage force Pike to look inward, whereas the circumstances of DISC force him to put on a very different “face” (i.e., a strong first impression in front of a new crew). I wouldn’t be surprised to see some cracks begin to emerge over the course of the season (as Mount seems to suggest above). @Holden these are my thoughts too, he acknowledged that he’d been struggling a bit after sitting out the war and with the Talosians confirmed for this season there’s certainly potential for a more introspective look at Pike. @Corinthian7 — the Talosians have been confirmed for this season? @Curious Cadet More or less. At New York Comic Con he was reported to have said “You guys like Talosians? We should see some”. I think he’s mentioned them in a few other interviews as well. @C7 — Ah, yes, now I recall. Could just be flashbacks — I’m sure Pike has plenty of nightmares about that episode. I’d hate to see too much done with them. Of course, there’s still a big hole in The Menagerie for me, as to how Spock came up with his plan, and why he thought the Talosians would even go along with it. As far as we know, Spock never had any interaction with the Talosians in The Cage. So there’s a lot more potentially to explore there before they rule Talos IV off limits. @Curious Cadet I get the impression that it will be more than flashbacks but I think this could be a good thing as it always seemed a bit extreme that Starfleet deemed visiting Talos IV punishable by death. In much the same way as I felt that ‘Lethe’ actually enhanced existing canon I’m hoping this storyline could do the same. That being said some flashbacks to around the time of ‘The Cage’ would be a good way of reconciling the differences in the character by showing that mentally Pike was in a different place prior to his encounter with the Talosians. He was great in the opener and from what I can see is now an instant fan favorite. I’m looking forward to more and especially when he says there will be more conflict and the crew. For some reason I didn’t expect that so that will be something to look forward to. Pike was instantly likable. A flashback to The Cage era would be nice. I’d like to see this universes take on the uniforms of that time. From what I gather in the episode, they got those uniforms before they left on their 5 year mission since of course they were wearing the colors in the Cage. Being the flagship it makes sense that ship would be the test bed for new unis. It is what I got from the dialog anyway. @El Dip, so in this universe their is no Cage uniform? @Mr. Limpopo — I’m not sure the uniforms would be that different. Maybe the collars would be the same color as the uniforms — the same as Disco’s, and I’d expect the yellow more muted, perhaps even more green, the blue likely the same shade as Disco’s, and the red would be beige. And no skirts. So just more muted versions which still justify Burnam’s line about their new uniforms being “very colorful”. Gold, silver, and bronze toned jersey under a more updated grey jacket. The 60’s cage colours could pass as g,s,&g. @Mr. Limpopo — I always thought the beige was gold, after I found out that green was the actual command color. But the Operations jumpsuits are undeniably beige; and green, blue and Khaki fit with Rodenberry’s military background — which I think actually inspired him. Either way, a retcon would actually sort of tie it all together by showing how the uniforms evolved, with Operations originally starting in Gold, and then returning to Gold in TNG. Meanwhile, the DISC solid blue uniforms tie to the ENT jumpsuits. The change of colors can be explained with TWOK uniforms going all red, and then keeping red for the command color. Green for command then ties to the original command color, which TOS perpetuated in the dress uniforms. On the other hand, I think these producers may be more interested in simplifying the iconic colors identified with the franchise. The Cage colors were two pilot episodes already way over budget, followed by a quick update as soon as they were able. For all practical purposes, the Cage uniforms should have been YBR, and in keeping with these producers penchant for visual reboot, likely are going to be. 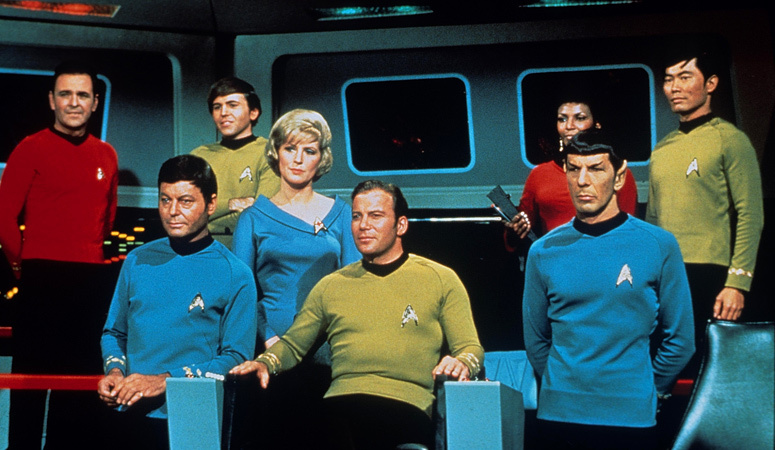 Given that Kirk spent one episode in command of the Enterprise in these uniforms, they’ve already thrown out that bit of continuity, so why not the Cage too? That said, if they are doing flashbacks to The Cage, having a different look for the uniforms would definitely help differentiate it from the present. It’s best to just view this as nu-prime or a different universe. I doubt they’ll stick to The Cage look if there’s flashbacks. This uniform coming in so early does scupper the WNMHGB uniform. I never felt like that episode was part of TOS continuity anyway, just a pilot. @Mr Limpopo — whatever works for you. I personally have no trouble with the visual reboot they’re embracing. Hmm, Not a fan of Doublethink. Especially for people that really don’t deserve a stitch of respect. Look forward to seeing Worf of Mordor in the Picard show. I think they changed the Klingons so Worf can basically look like himself if he does show up on the new show. And I know a lot of people just prefer to see this as a different universe than Prime but it looks like they are trying to gel it closer to prime a bit more at least. New Klingons and the uniforms are a start even if still not quite there. When I was rewatching the episode last night, I caught the line where Saru says something like the red burst could be a mass hallucination (I think it’s right after Pike starts to ask where his “red thing” is). That reminded me of The Cage and then I started to wonder if that fortune cookie is foreshadowing and not just a fan callback. I didn’t catch that line but I agree the fortune cookie was foreshadowing and possibly even a message from the Talosians. The message would appear to fit in with Culber’s resurrection and also what Mount said about Pike’s 3rd act being treated as a victory rather than a tragedy. He’s very brave to be taking on this awful show.